That's the official finding, that's what everyone believes. Cooper's girlfriend, Libby, has her doubts. They'd been happy, in love. Why would he take his own life? 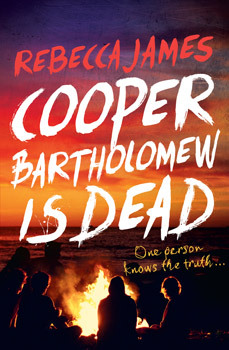 As Libby searches for answers, and probes more deeply into what really happened the day Cooper died, she and her friends unravel a web of deception and betrayal. Are those friends - and enemies - what they seem? Who is hiding a dangerous secret? And will the truth set them all free? A gripping new novel from the author of Beautiful Malice and Sweet Damage. Rebecca James was born in Sydney in 1970. She spent her early twenties working as a waitress, her late twenties teaching English in Indonesia and Japan, and most of her thirties having babies and working as a kitchen designer. Her first novel, Beautiful Malice, was an international publishing sensation, selling in 52 countries. This was followed by Sweet Damage, published in Australia in 2013. Rebecca now lives in Canberra with her partner and their four sons.